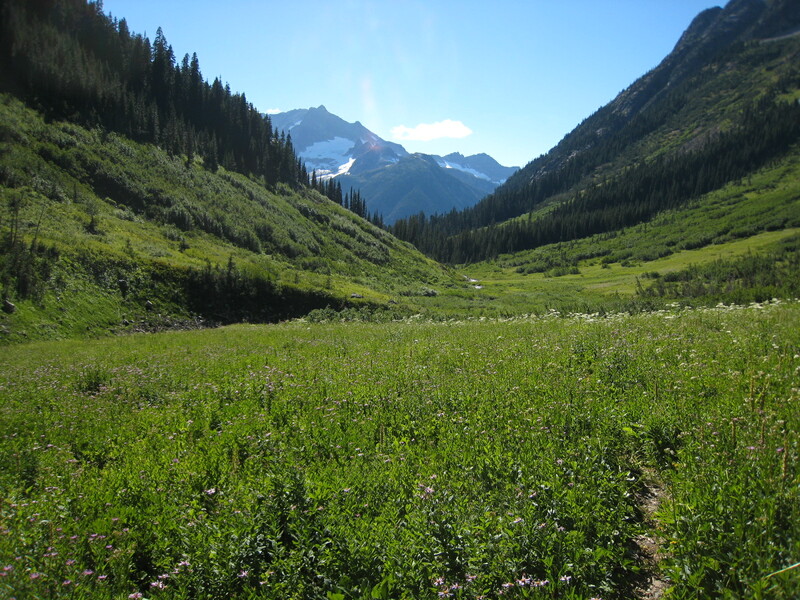 Meadow near Fisher Camp, North Cascades N.P., WA, 8/2012. We’re Tom & Tara, avid backpackers and appreciators of the wealth of flora in our pacific northwest terrain. We hope this blog will make it easier for others to identify and enjoy these beautiful wildflowers. All photos are ours, unless noted otherwise, taken during hikes and backpacking trips in the Pacific Northwest. We welcome your comments, corrections and your own wildflower photos. 7/11/11: Just returned from a fantastic vacation in Banff. While it isn’t technically the pacific northwest, it is north and it is west. So we’ll be posting flora from that trip in the next few weeks. 8/23/11: We’ve posted almost all the wildflower pics from our Banff trip. Luckily, we’re headed for 4 nights on Mt. Rainier’s northern loop beginning Thursday. Supposedly, this may actually be a good time for wildflowers after the cool summer we’ve had. We’ve also got a fancy new SLR camera that we’re lugging along. With luck, the new pics should start rolling out sometime mid next week. 9/10/12: Had a great trip in North Cascades N.P. in late August. Saw a lot of wildflowers and getting a little more skilled with the new camera. We plan on trickling the new photos out (one per week) so the blog can stay active at least till late fall…Also updating some old posts with new and better photos and info, so click around and you might find something new. 4/28/13: Started this season with a weekend trip to the grassy plateaus of the eastern Columbia Gorge. Despite our close proximity, we’d never seen what many people believe to be Oregon’s best springtime wildflower display. We were not disappointed! Look for pics in the upcoming weeks. 6/29/14: Finished adding three new categories. You can now sort posts by elevation (low, mid, alpine), peak bloom (month) and location (cascades, coast, etc). Also added a category for flowers that are “unique to the northwest.” Click the drop down category tab on the right side of the home page to sort by these and more. Great blog, nice photos! I especially like the way you categorized the flowers by color. I subscribed to your site. Looking forward to your Banff photos. A flower as lovely as a blog. This is my first blog post ever! (I’ve never been accused of being cool or pioneering.) Love the site and it’s very helpful for identifying flora. Nice work, you guys! Finally, you have a reason to backpack. Love it. Miss you. I’m glad to see other people highlighting the flora of their region. I’ve focused on central Texas. I have really enjoyed your website. It has been very helpful as I am just a beginner trying to learn identification of some of the most common species. And putting everything in the context of backpacking makes it all the more interesting. If not, just consider this nomination to be an expression of my gratitude for everything I have gotten from your posts I hope to see more when the weather allows. I am so glad to have found your blog. You have done an awesome job of identifying and labeling your wildflower pictures. Tom and Tara– this looks great! Am wondering whether you get specific about Columbia Gorge wildflowers? When I’m out and about it’d be helpful to grab a summary of what’s in the area I’m visiting. Can’t wait to see what you come up with at Mt Adams! Next Adventure has a wildflower identification presentation for Mt. Hood and the Columbia River Gorge Spring Wildflowers on Tuesday, April 18, 2015. It starts at 7pm at the Grand Avenue Store, in Portland. It’s free. Oops, that should be Tuesday, April 28th! I love your blog! Is there a book that you can recommend for wildflowers for someone living in PNW British Columbia? I’m trying to plant only native species and also for forest walks. Thanks! Thanks for your comment! And for being a part of our best year ever on the blog! In our travels, we’ve found significant overlap with BC & US PNW wildflowers. Thus most of the books on our “bookshelf” are highly recommended; Scotter & Flygare specifically covers the Canadian Rockies. For help with your own garden, you might try Arthur Kruckeberg’s “Gardening with Native Plants of the Pacific Northwest” (1982), or visit his botanic garden/nursery on Seattle’s northside.